Is a lifestyle at the beach for you? A dream of a lifestyle at the beach usually involves white sand beaches, palm trees, and quite a few piña coladas. This dream can easily turn into a nightmare if you don’t figure it all out in time. 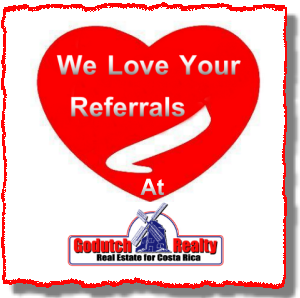 GoDutch Realty services only the west side of the Central Valley. That doesn’t mean we can’t assist you. 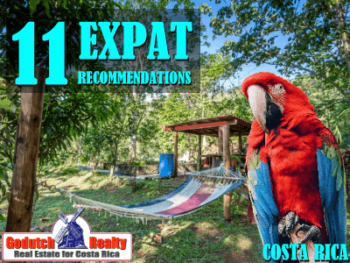 Our agency is a member of the largest Costa Rica MLS, the American-European real estate network. Our network covers almost every beach in Costa Rica. During the monthly Christopher Howard retirement tour, I usually find several participants looking for that lifestyle at the beach. They see themselves enjoy being a beach bum, sipping piña coladas and getting that eternal tan that only millionaires and smart retirees seem to be able to get. Can you do it too? 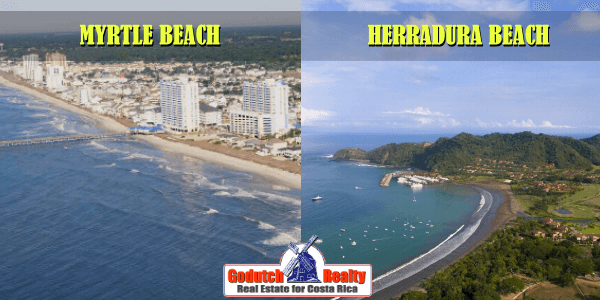 Find out if you prefer a lifestyle at the beach in North America or in Costa Rica. 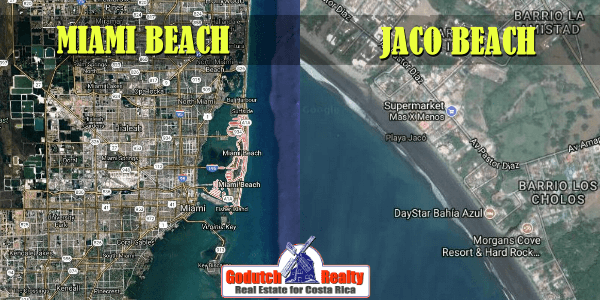 Many imagine large beach towns such as Miami Beach, Myrtle Beach or Huntington Beach. Those cities have boardwalks, promenades, art galleries, wine bars and innovative restaurants. The beach towns in Costa Rica have empty beaches without people and boardwalks, lots of surf shops, unpaved roads, jungle and plenty of adventure. Our beach towns have a totally different flavor of than what you might expect, which is why a visit in person is so important. All our beach towns are small and you can walk from one end to the other, even in the largest town, in less than 20 minutes. Every town is totally different because the weather circumstances and even the cultural circumstances are different. As you see, those are two totally different worlds and each attracts distinct customers. It’s your job to find out which one you prefer for your new lifestyle. Behind each of those beaches are huge metropolitan cities with millions of people. Jaco Beach, the largest beach town in Costa Rica, registered 15.441 in 2016, while Dominical had 3,306 in 2011 (last census). Miami – Dade has 2,456,378 residents while Huntington Beach had a population of 189,102 in 2016. 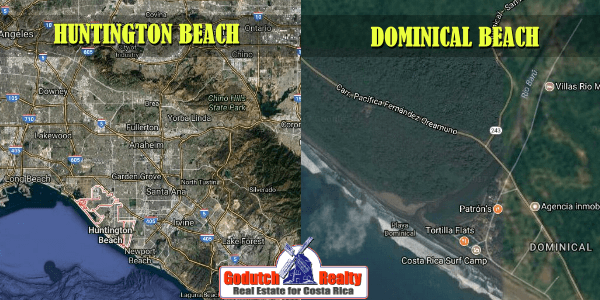 A common petition from clients is “We would like to be on or near the beach (short walk or drive is okay), possibly in an elevated area with breezes.” Although it’s better you see it with your own eyes, let me try to explain in a few words. If you are in an elevated area, with a breeze, you won’t be able to walk to the beach. But, you could drive. 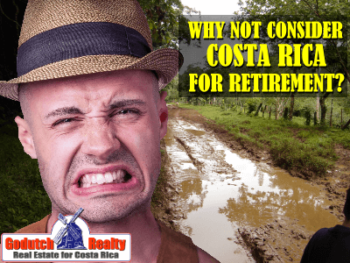 Buying or renting a beach property in Costa Rica will take some due diligence. To own beachfront property, you first need to understand the maritime zoning and take your precautions. Our beach homes and beach condos do not compare to what you find in the much larger beach cities in the U.S. It depends entirely on your budget, just like it would elsewhere, to get what you desire. 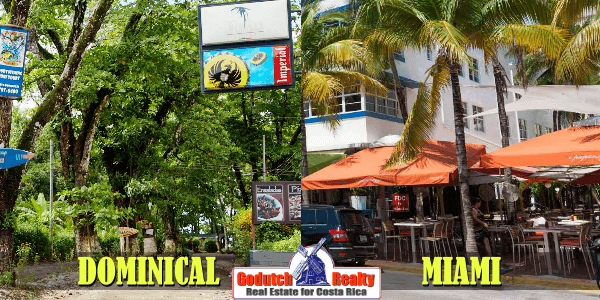 Some beach towns in Costa Rica offer health clinics, lawyer’s offices, doctors, dentists and other professionals. Other beach towns don’t have more than a pulperia and a cantina. 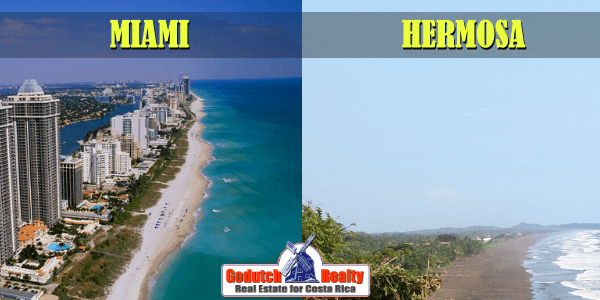 Some future expats expect to find the same beach feeling and amenities that you will find in Miami Beach or Huntington Beach. I’m sorry but in that, case Costa Rica can do nothing for you. Costa Rica has a whole different type of amenities such as national parks, spa & yoga, and bird watching. The beaches in Costa Rica are not all white sand beaches. There are also black sand and yellow sand beaches. Most are almost or totally empty where you might not see anyone else for miles. Not what you are looking for? Try downtown Jaco or Tamarindo on a Sunday, you’ll find busloads of Sunday tourists that will give you some company. Our beaches are incredible to some, boring to others. A lifestyle at the beach can offer you the most amazing ocean views you’ve ever dreamt of. Especially if you decide to live on one of those ridges that also give you city views. So you won’t be looking into a black hole all evening. Of course, some of the incredible combined day-time jungle and ocean views might be well worth it. A few locations in the Central Valley also offer ocean views, such as Atenas and San Ramon. There are a few beach areas with a golf course. 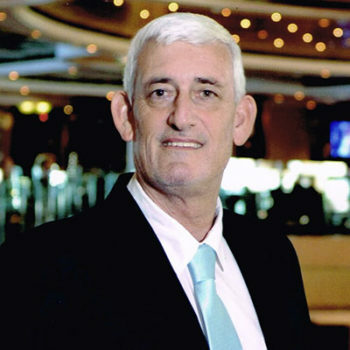 Some are in exclusive resorts, that offer a fancy lifestyle at the beach, with or without a marina. Don’t waste your time looking for something that’s not there. Play a couple of rounds before you decide to buy a beach house or condo in the area. If you plan to move to Costa Rica for the piña coladas, you can drink yourself silly. A lifestyle at the beach will give you plenty of great options such as Margaritas, Mojitos, Daiquiris, and other cocktails. If you are already an alcoholic, it might be healthier for you to choose to live in the Central Valley. That’s because you won’t get bored so quickly in the valley. I’ll even give you a tip on how to save on booze in Costa Rica. You might not realize it, but you can have a choice of temperatures and humidity. The Costa Rican Caribbean weather is totally different from the Central Pacific and South Pacific, while the North Pacific offers a different heat altogether. You should learn all you can about the temperatures and the humidity each beach has to offer before you move. At least, you don’t have to worry about the hurricanes here. Living at the beach is usually more expensive than in the Central Valley unless your diet is based on peanut butter sandwiches. If you enjoy good quality food, accompanied by a nice bottle of wine, check out the cost of living before you decide for a lifestyle at the beach. 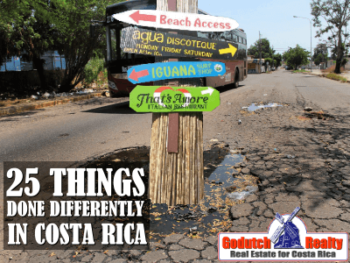 Check out the different beach areas in Costa Rica thoroughly. Don’t look at property yet, visit first and then get the feel of every place and go down the check list you made. Oh, and don’t turn yourself into an alcoholic out there. 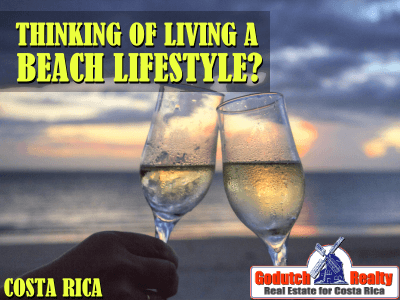 If you think you will enjoy a lifestyle at the beach in Costa Rica, go to our MLS and look for property and information there. Only in case that you realize that a lifestyle at the beach is not what you are looking for, contact us. Más Tico que el Gallo Pinto!